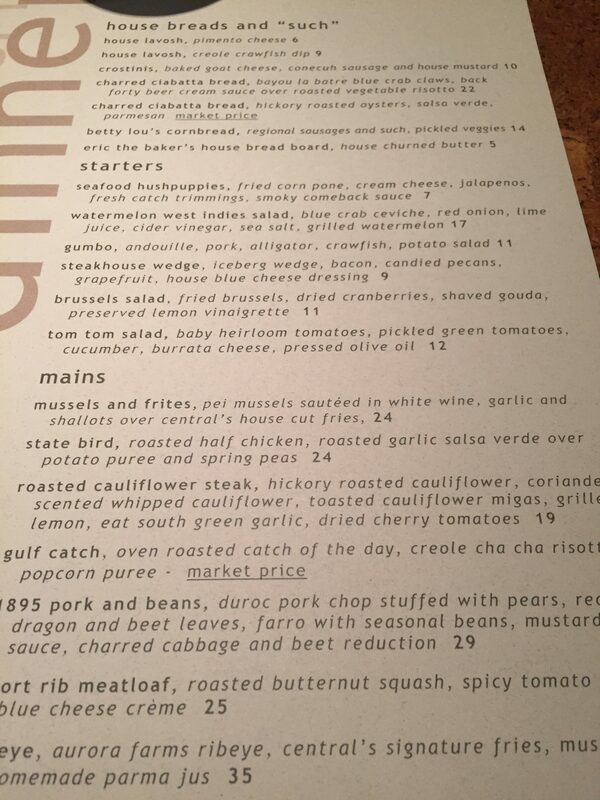 A lot has changed in the four years since the Alabama Department of Tourism asked us to write a blog post about vegetarianism for their “Year of Alabama Food.” Since we authored that post back in 2012, a lot of Montgomery restaurants have closed, and several new ones have opened. And despite the end of the “Year of Alabama Food,” we’ve remained happy and well-fed. Montgomery is still a city where you can get a thoughtfully-prepared meal at a fair price. The Tourism Department’s promotion of our state’s cuisine remains active, but we’re happy to tell you about two of our most recent culinary discoveries on the vegetarian scene in Montgomery. As we’ve been saying all along, there’s more to eating well in this city than just barbecue and fried chicken. Much more. One of the recent highlights was the vegetable risotto at A&P Social. Often, risotto is a bland bit of chewy starch offered to vegetarians instead of a real meal. 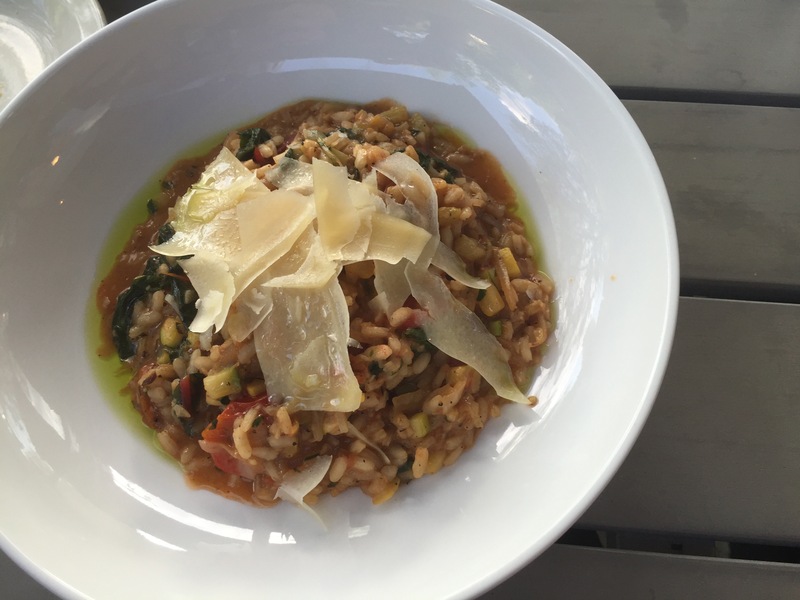 But A&P’s risotto was an absolute stunner – laced with basil oil, a perfect and rich mix of vegetables, and the ideal portion size. 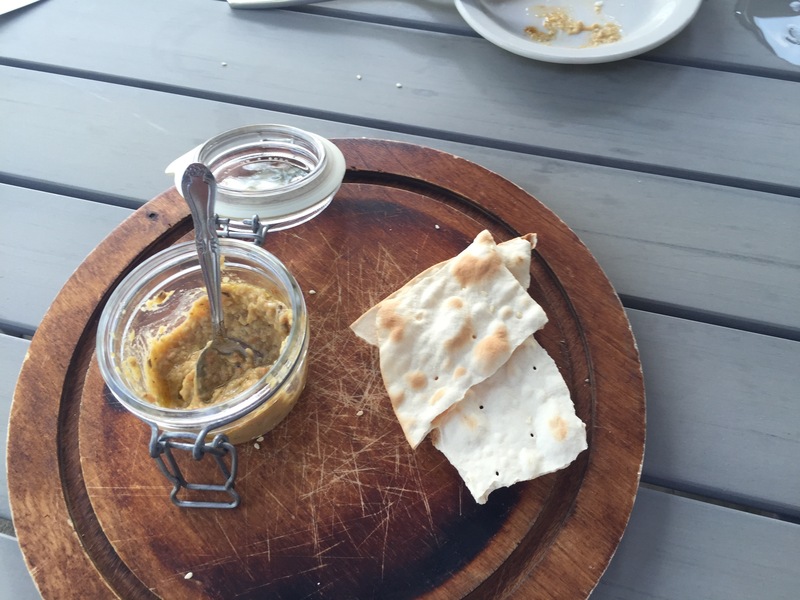 Paired with a nice white wine for summer, it was exactly right for al fresco dining. There’s not much else vegetarian on the current A&P menu, but, honestly, this dish alone was worth the trip. The other great thing going on at A&P is the seasonal cocktail menu. Jess, the bartender, can be seen harvesting fresh herbs from the pots outside to muddle in your drinks. But A&P doesn’t have the monopoly on high-end vegetarian entrees in Montgomery. 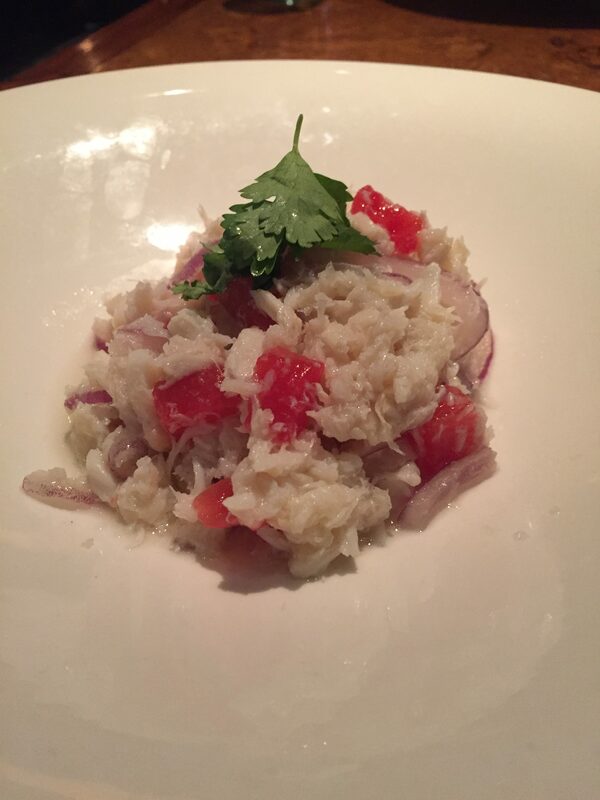 We recently went to Central to see how they’re faring under their new chef, Brandon Burleson. We had been sporadic, but supportive diners at Central under their previous chef, Randal Gresham (who now runs the kitchen at A&P). Although the ambiance remains the same — exposed brick, open kitchen, great lighting — we’re excited that the menu is even more vegetarian-friendly under the new regime. They’ve got an in-house baker there now, which is pretty cool. We started with the charred ciabatta appetizer, which is one of the more interesting and delicious things we’ve eaten in a long time. 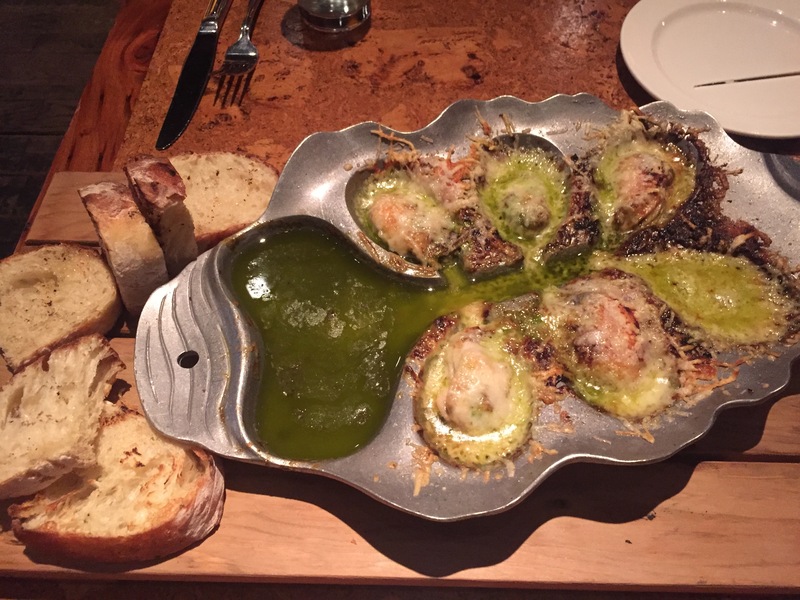 Six oysters are broiled in some kind of special metal pan with cheese on top; their salty, briny juices pooling at the end of the dish for dipping the extraordinarily good bread. Next time we might order this as an entree. It’s amazing. 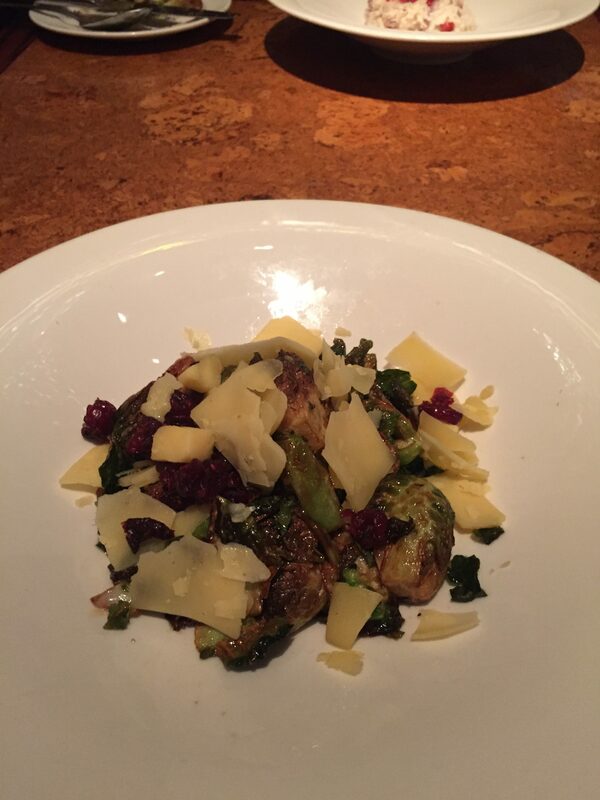 The other one of us got the Brussels salad, which had shaved Gouda cheese and dried cranberries – a rich taste. And that’s where we should mention something else about Central – the service is just magnificent. When the Brussels were a bit too salty, another version magically appeared, perfectly corrected. Glasses are always refilled, wine produced by magic (the wine list is great, my Sancerre was absolutely perfect). We probably could have stopped eating at this point, but we’d been very keen to try another vegetarian entree, the cauliflower steak. Although we were excited to see it on the menu alongside the expensive cuts of meat, the end result was a bit disappointing. 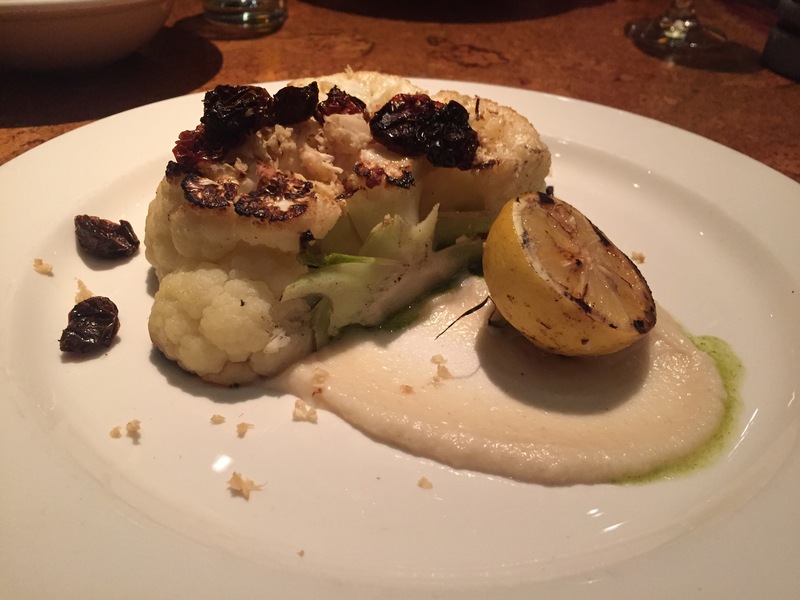 Cauliflower can change so much in the oven, caramelizing and becoming luscious. This particular offering needed more time. It was thick and seemed to look the part, but was fairly bland and unremarkable. But it’s got promise. We were also keen to eat mussels and fries. Having recently been to Belgium, we’d developed a taste for what they told us in Brussels is practically a national dish. The version served at Central made an odd (to us) choice to put the French fries under the mussels and their delicious, if salty, brine. This seemed to defeat the purpose of crisp slivers of potato, reducing them to mush. 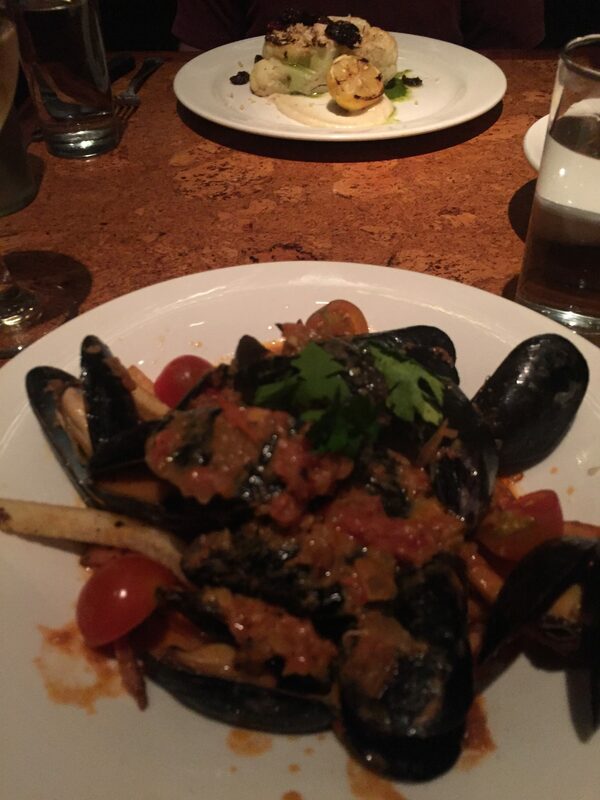 The mussels were really good, though. All in all, we’re excited to keep hitting the local dining scene on those nights where we don’t feel like cooking at home. There are some great restaurants in town, and the move to vegetarian-inclusive menus suggests that we’re getting to be a more cosmopolitan and exciting city by the day.